I've been having a bit of craft fever lately now that the snow has been falling and it's been too cold to go outside. 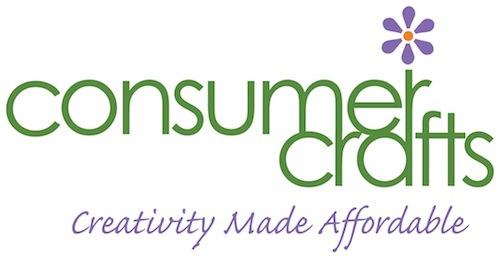 A trip to the craft store hasn't sounded like much fun and so I was happy to check out ConsumerCrafts.com. Ordering all my crafting supplies without having to leave the comfort of my home is awesome! Right now through Feb. 4 they are having their Buy More Save More sale. You can score a bigger discount (up to 25% off) the more you buy and they sweeten the deal with some free shipping for orders over $100 bucks. I loaded my cart up with just over $50 of supplies and WOW did I get a lot! I have plans for some Valentines Day treats for my kid's classmates from school. I also needed something to decorate my daughter's newly made-over bedroom (still in process). Then I realized that my acrylic paints were running low and so I stocked up on several different colors from Consumer Crafts Basics. I also popped some candy making molds into my cart just for fun! The prices are amazing and the selection is vast. The shipping was fast and my order was accurate. I highly recommend Consumer Crafts.